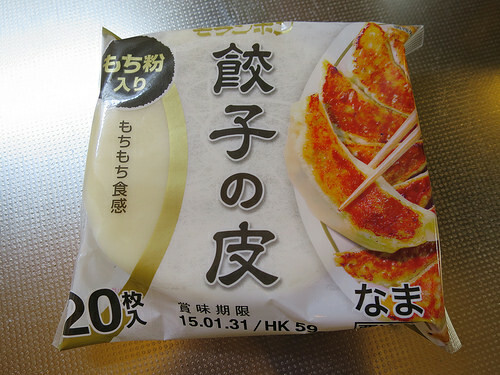 I would like to introduce the original gyoza recipe of Toyo Gyoza Guide presented in the TV program “Matsuko’s Unknown World” the other day. 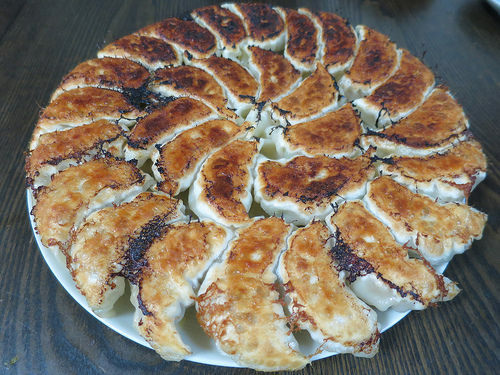 Japanese style dumplings, gyozas are easy to cook so please try yourself. The recipe will be divided into 2 sections. 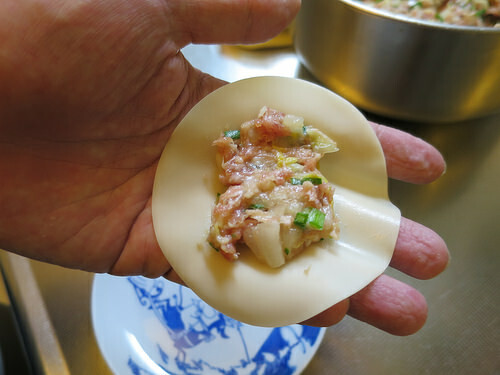 Then, let’s start making Japanese style dumpling, Gyoza. 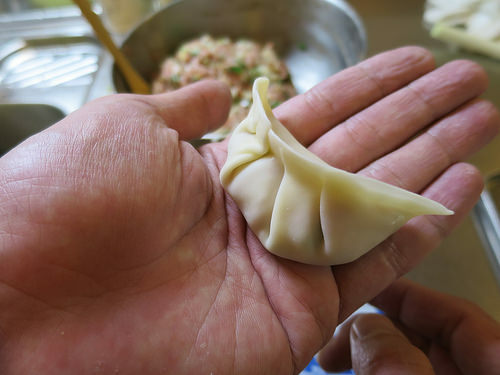 At first, make the filling. It’s an important point from the beginning. 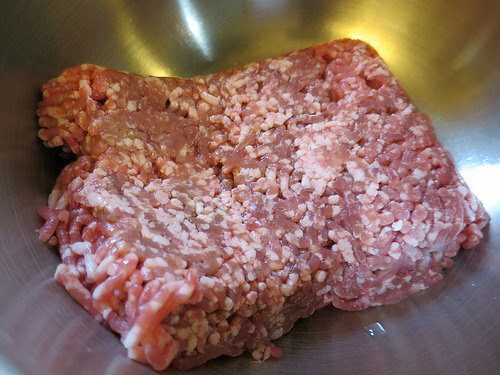 It’s important to knead only ground meat thoroughly. 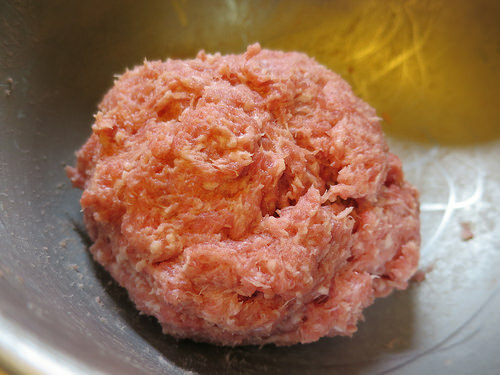 By doing this, the taste becomes easy to be sunk into pork, or it becomes juicy. 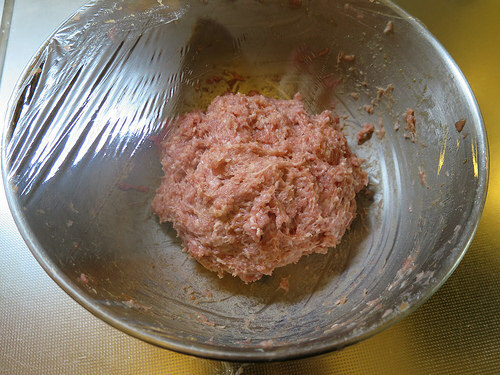 Knead until ground meat becomes like paste state, and it turns this color. Next, Mix the seasoning. The point is to start with liquid and followed by granules. It’s difficult to mix Chinese soup stock, so please add a little hot water to mix easily. We then prepare the vegetables. For Chinese cabbage, if you use pickles, it tastes nicer. 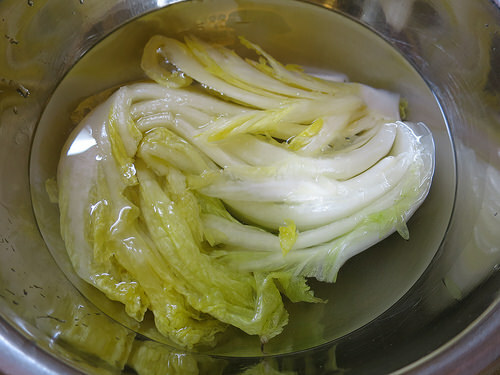 If you cannot get pickles, rub normal Chinese cabbage with salt. Please wash in water first and remove saltiness. 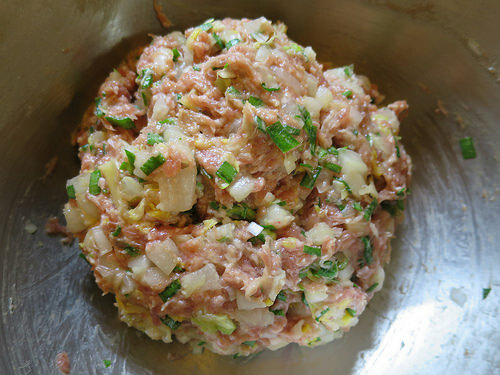 Squeeze lightly and chopped coarsely. 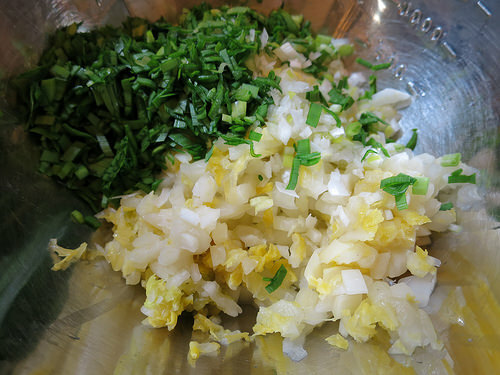 Chop leek and leek into small pieces. Cut vegetables are mixed with the meat on the bench. 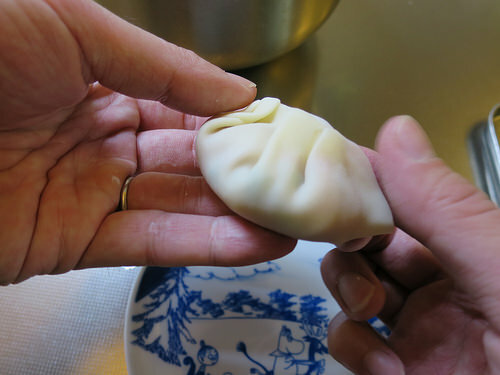 It’s important to mix gently so as not to crush vegetables.Now, filling of Chinese dumplings has been completed. Next, let’s wrap filling with wrapper. We will use the wrapper available in the market. Wrappers with rice flour is recommended. 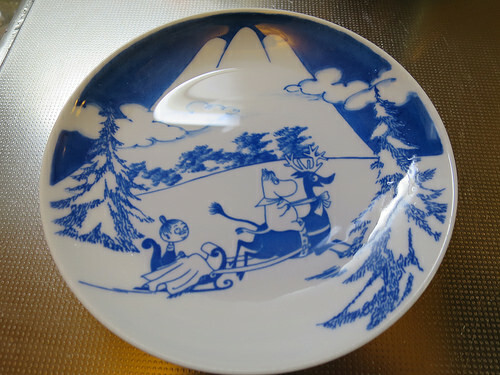 Have some water ready in a small plate. Apply water on the rim of the wrappers to make it stick. Place 15g of filling on the center of the wrapper. 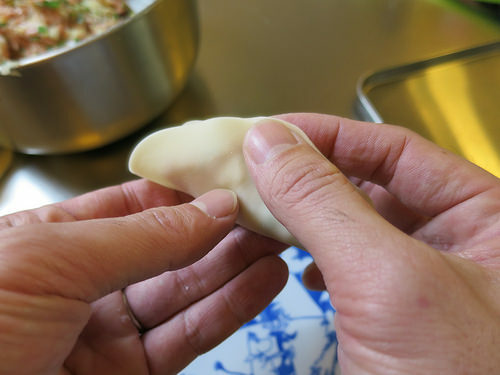 Fold the wrapper in half and stick the top of the semicircle. Press well so that they stick well. Fold the wrapper from the left side to form two pleats, pressed to stick. Make two pleats from the right side as well. 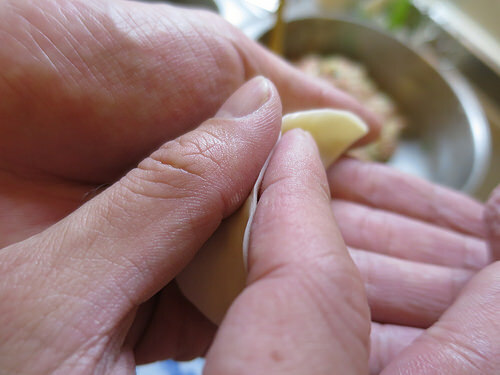 Press the pleats with the ball of your finger and press to stick. 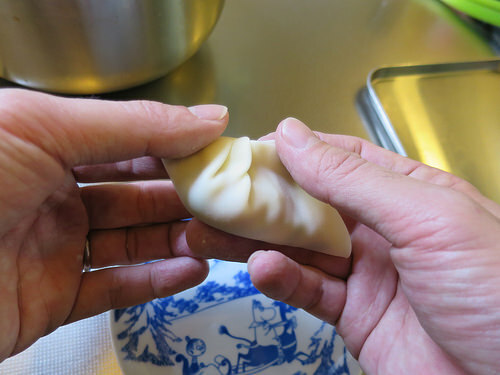 If pressed sideways, you will get neatly shaped gyozas with aligned pleats. Adjust shape to complete wrapping. 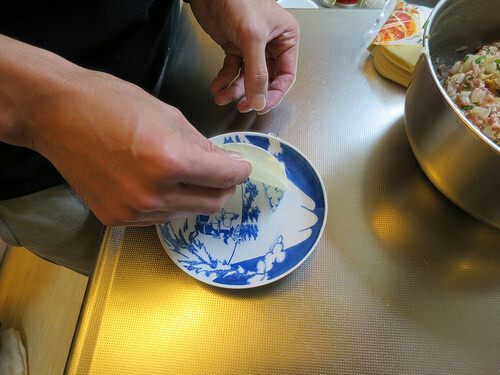 Cover with plastic wrap so as not to dry the gyozas. Let’s move to the steps for cooking.